Designed for bottom line performance (think profitability), this clamp combines Seagull's traditional use of long lasting Carbide disk seat and industry approved construction materials. It can be adapted to most any spindle however shines when mated to Seagull's Ultra Low inertia Spindle for unmatched performance in the industry. Very light 7075-T651 Aircraft Aluminum Alloy construction, Electroless Nickel plated and ground to perfection, this clamp will provide years of exceptional service. It is also available in a variety of sizes and configurations to meet your most challenging high throughput requirements. 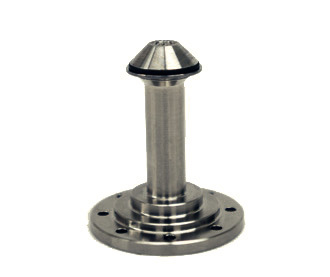 1) Aluminum, Nickel Plated construction with solid Carbide disk seat. 4) Shown with Seagull proprietary elastomeric cap for excellent grip. 6) Available in many sizes and configurations: just ask!